"An 11 on a scale of 1 to 10! Fantastic flavor of butterscotch and peanut butter with the crunch of Rice Krispies®." LIne a 9x13 inch pan with parchment or waxed paper. In a microwave safe bowl, melt butterscotch chips in the microwave or over a double boiler, stirring every 30 seconds until smooth. Stir in the melted butter and peanut butter. Measure the marshmallows and rice cereal into a large bowl. 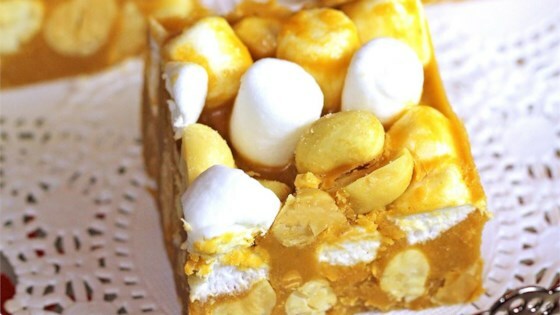 Pour the butterscotch mixture over the marshmallows and cereal. Stir to coat evenly. Press onto the prepared pan. Chill for 20 to 30 minutes, until set. Cut into bars. Store leftovers in the refrigerator. Can’t decide between cookies, caramel candies, or chocolates? They're all three! We tried it (my wife and I), then gave some to my inlaws, then brought the remainder to work. . .overall its just too much. . . I tried this recipe and it turned out hard as a rock. Almost like peanut brittle. Followed the directions to a tee. May try one more time later.